Our Lady's beauty has been described as blinding to behold. This simple, yet elegant Our Lady of Fatima Anniversary rosary is sure to surprise you by its undiluted purity and grace. 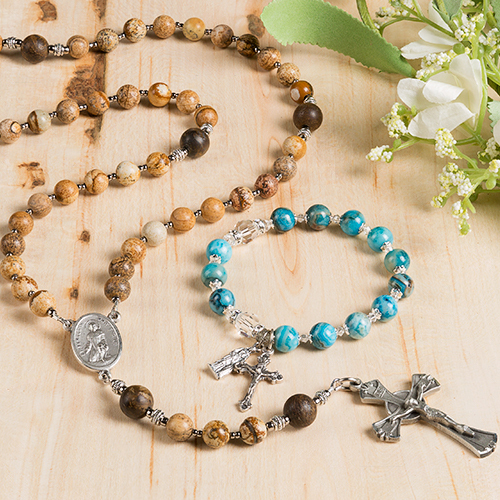 Classically beautiful, this stunning rosary combines ivory magnesite beads (inspired by the color of the robe most traditionally shown on the images of Our Lady of Fatima) with an antique bronze centerpiece and crucifix, making it a unique gift and a lifetime personal faith companion. 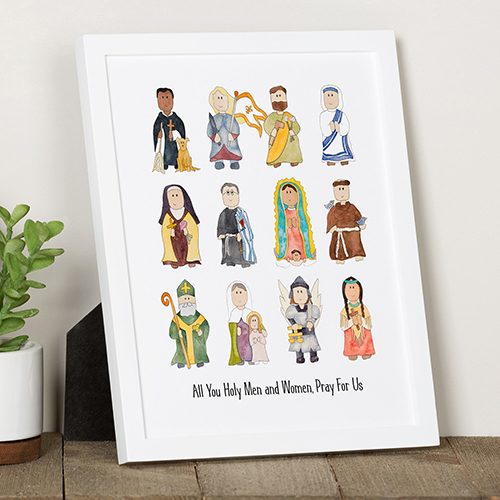 Comes with a prayer card featuring the 20 mysteries of the rosary and which days to pray them. In a world torn apart by persecution, war and oppression, three children in Fatima, Portugal were chosen by God to offer an urgent message of hope to the world. Our Lady gave a secret to the children told in three parts, from a harrowing vision of hell, to prophetic warnings of future events including the advent and timing of the Second World War, the spread of communism, and the attempted assassination of the Pope. The 100th Anniversary of the apparitions of Our Lady of Fatima was celebrated between May 13, 2017 and October 13, 2017. Beautifully made. Very Sturdy plan to place it on our lady statue in my prayer corner. I bought this for bride to be and gave as a shower gift. A beautiful wedding keepsake and useful too! This is a beautiful rosary. I like the size of the beads, and look forward to praying the Holy Rosary with it. I'm not a fan of the wired construction however, to me it is too stiff. I removed the wire and reconnected it with rosary pins and links which I purchased, and it is a wonderful, beautiful prayer aid. I bought 3 more times. Beautiful Rosary, I'm really glad I got it, along with the other Fatima merchandise. 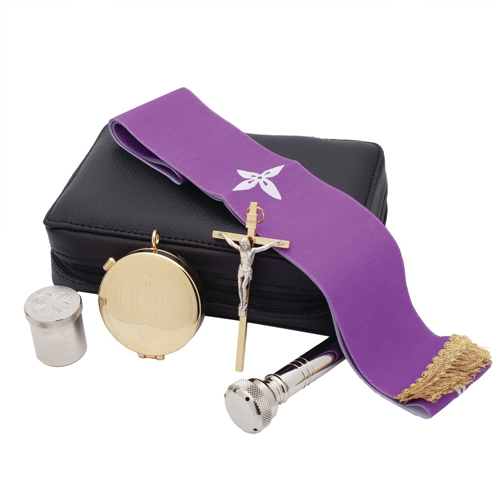 It was thanks to Our Lady of Fatima that I reverted to the Faith, so I just had to get this stuff. Other people commented on the heaviness of the Rosary, and I've got say it really quite heavy, I really like it, it makes me think of Our Immaculate Mother's protective strength. This rosary was more than I had expected, beautiful!! The most beautiful Rosary I have seen in Years. 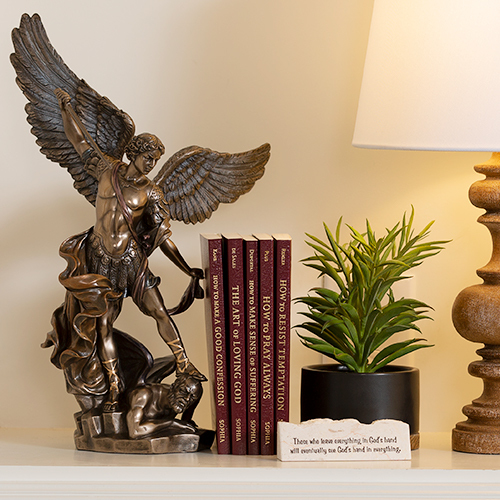 Beautiful details and We are proud to have found this and to own one. I loved them. Prayed with them daily but after only a few months, they broke. Not as durable as what one might think. I feel sad as I spent so very much on these and expected more. My daughter gave me this Exquisite Rosary for my birthday and I can't adequately explain the beauty of it. It's sturdy and the beads are large enough for those of us with arthritic fingers. The picture just doesn't show it's true beauty. Love it ! I chose these rosaries to give as gifts to my two daughters. 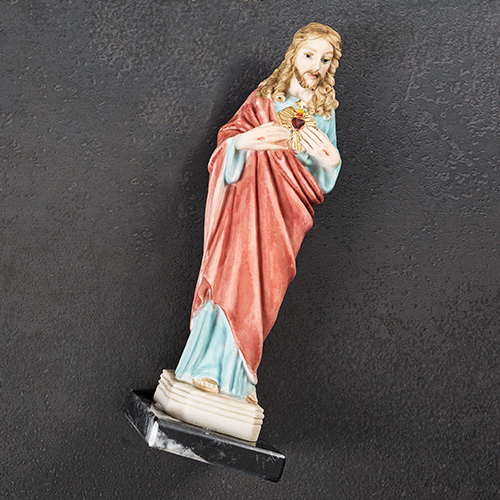 The purpose was to help them keep the faith in the Catholic Church. 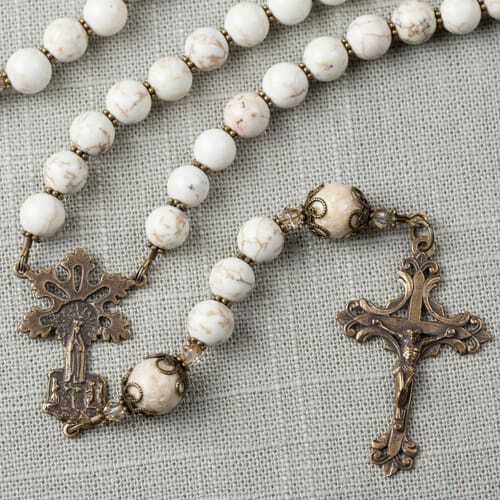 This rosary is much more beautiful than the picture; the soft creamy white beads with soft brown marbling and the bronze metal reminds me of statues of Our Lady of Fatima. This exceptional rosary helps to elevate my prayer participation in the 100 year anniversary. My only criticism of the rosary workmanship is that there is no spacer loop where the rosary chains attach to the center medal causing frequent binding. The rosary is lovely-quite heavy and substantial. The rosary is strung tightly; it may relax as I use it. On my particular rosary, the 5th decade has a few consecutive beads whose holes are drilled a bit off center, so that decade sits a bit wonky. The rosary wiring occasionally binds at the center Fatima medal, as the wiring is connected directly to the medal with no spacer ring for movement. I worry a little that the medal's loops could break if torqued. Still, I just LOVE the rosary. I was a little disappointed about this rosary. I was intending to give it as a gift but it comes in a plain box with Catholic Company on the outside. There is no documentation anywhere explaining that it is the 100th anniversary rosary or any type of information associated with it's meaning and origination to Fatima other than the triangular medal. 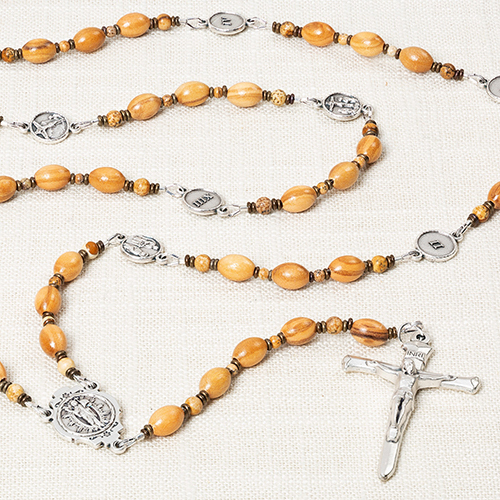 The rosary is good quality but put together so tightly that the beads don't want to lay uniform and tend to bunch up. I love this Rosary. I had it blessed by the parish priest today. It is heirloom quality. Very well constructed and much more beautiful in person. I believe these rosaries must be handmade with utmost love and in a prayerful attitude. This rosary is calming and helps me pray with humility and thankfulness. Thank you Catholic Company for making this most beautiful rosary and making it available to us. God Bless You! The rosary I was given by my late Grandmother was stolen. I was devastated! So I could hardly believe my eyes when I saw The Fatima rosary was almost identical to the rosary that was stolen. I placed my order that same night! It arrived ahead of time, unfortunately a thief got to it before I did. As soon as I realized my package was stolen. 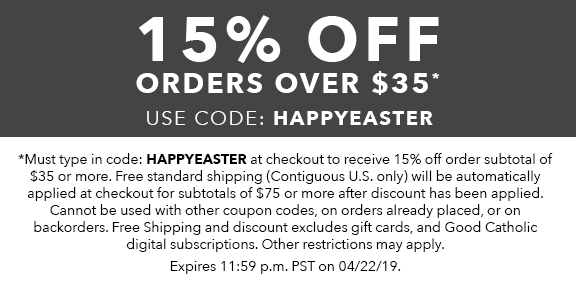 I called The Catholic Company and they resent another rosary ASAP. 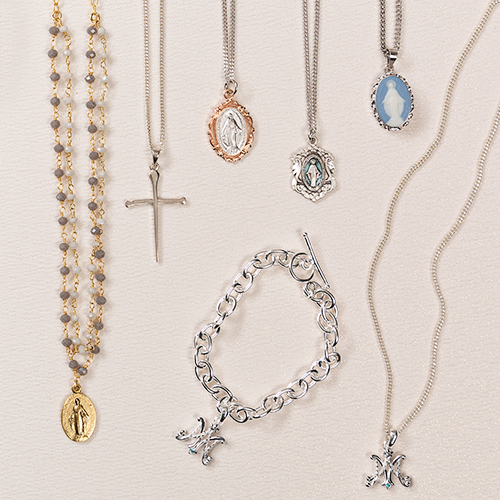 The Rosary is exquisite in person and would make truly beautiful gift. This rosary was a true honor to behold and touch! I am thankful for the people wherever they are for making this Rosary so beautiful. I will be giving this particular Rosary to my mom, whose 50th Wedding Anniversary is this year. She always was more fond of Our lady of Fatima than me. Hello, Jeannette! Thank you for your review. 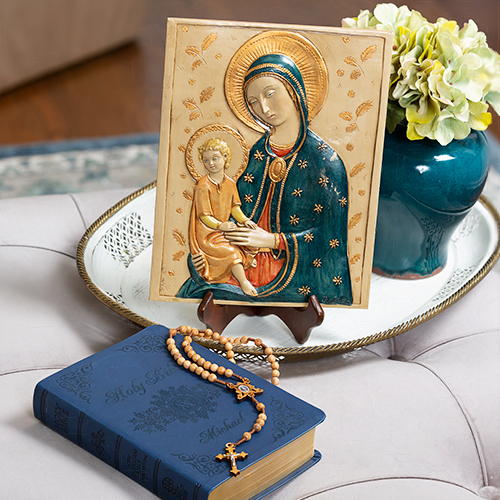 You might like to know that we make this rosary ourselves, right here at The Catholic Company. 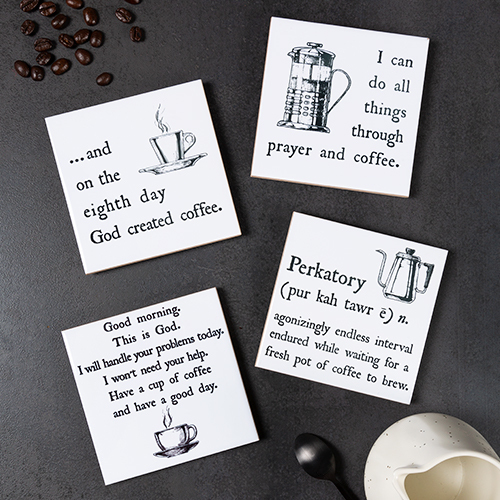 We have talented employees who make each one by hand. Beautiful rosary. Weight suggests quality, and the beads feel great in the hands. I often pray at night, (after the lights are out), so having the bead between the decades made in a different size really helps when you can't actually see the beads! Very happy with my purchase. Well impressed about this rosary with confident feelings of righteous traits intrinsic in the work. Such a beautiful rosary. So pure. The weight of the beads are the perfect weight and comfortable to hold. Such a beautiful reminder of Mary.